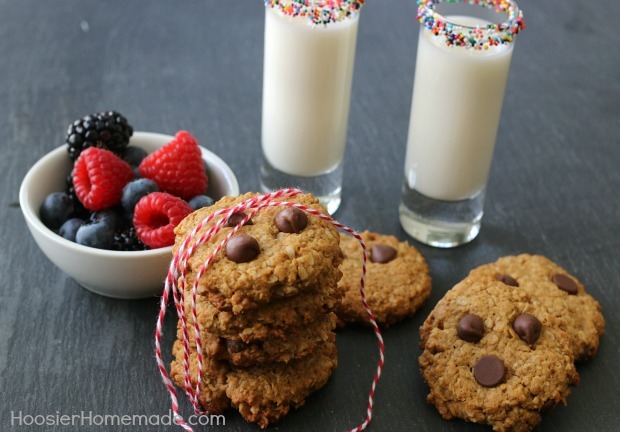 It’s time to fire up the oven, grab your baking ingredients and whip up these Chocolate Peanut Butter Oatmeal Cookies! I know what you are saying – but I’m trying to eat better this year! Well never fear, these cookies are flourless and have less sugar! There is something about the combination of chocolate and peanut butter that I just love! And you simply can’t go wrong when you put the flavor combination in a delicious soft cookie! 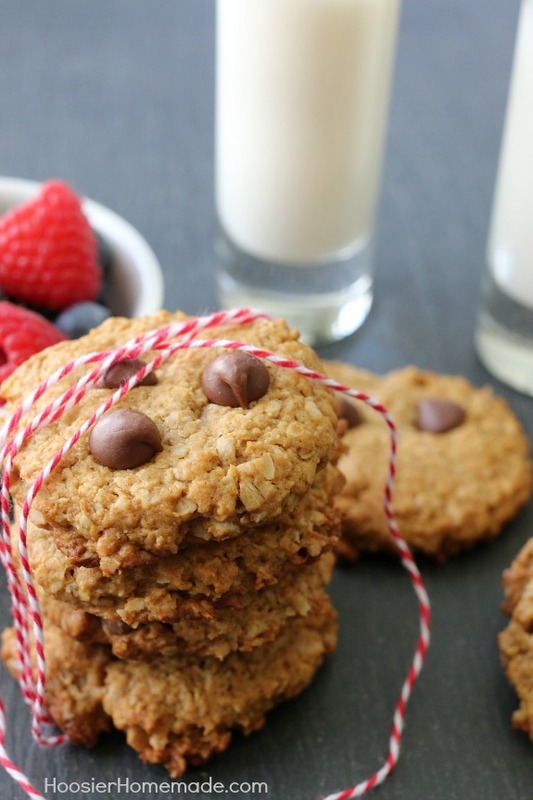 These Chocolate Peanut Butter Oatmeal Cookies just might surprise you though. They are made with no flour and they have less sugar! Perfect! Wouldn’t the kids be excited to come home from school to this fun treat? The shot glasses are easy to do – add nonpareil sprinkles to a paper plate, dip the rim of the glass in water and then in the sprinkles. So fun! You have seen many of the recipes that I have shared using Truvia Baking Blend, and read about my love for the product. There have been recipes for cupcakes, fudge, bread, cheesecake, and even caramel sauce shared! And yes, cookies – wonderfully delicious cookies! Diabetes and heart problems run in my family, so any place I can cut back and still feed my sweet tooth, it’s a win-win. 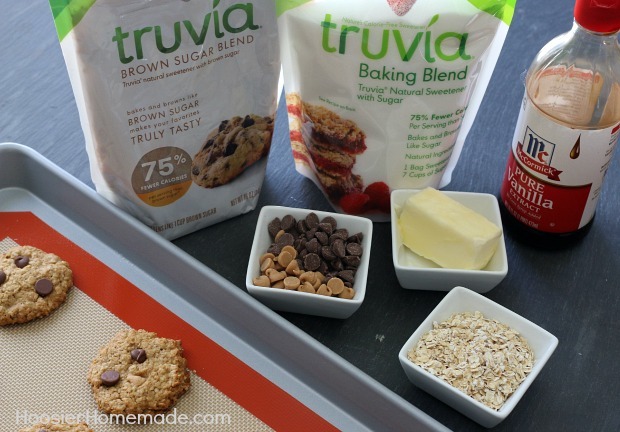 These oatmeal cookies have a combination of Truvia Baking Blend and the new Brown Sugar Blend. Truvia Brown Sugar Blend is designed for the home baker and is made with a blend of Truvia natural sweetener and brown sugar. If you are making a recipe that calls for regular brown sugar, just substitute half the amount. For example, if the recipe calls for 1 cup of brown sugar, use 1/2 cup of Truvia Brown Sugar Blend. I started with a recipe that I found on the Truvia website, Monster Cookies. But instead of using candy, I used Peanut Butter Chips, giving the cookies extra flavor. 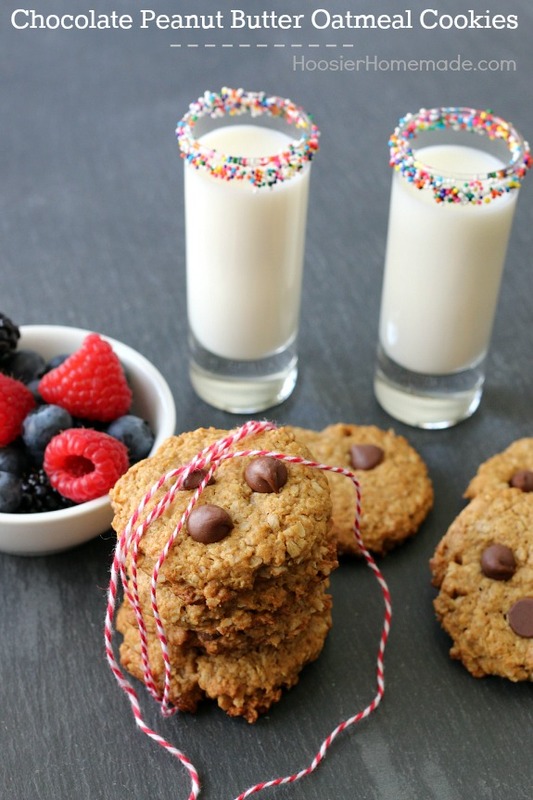 You may also like these Bar Cookie Recipes made with Truvia Baking Blend and Brown Sugar Blend. Fans can post a snowman-inspired photo via a tab on the Truvia® Facebook page or by using #SweetWarmUp on Twitter or Instagram for the chance to win a Snowman Building prize pack, a Sledding prize pack or a Cozy Up prize pack! 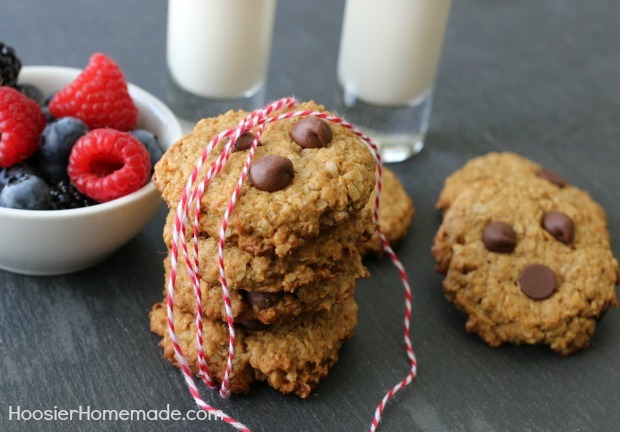 Chocolate Peanut Butter Oatmeal Cookies - you will never be able to tell they are flourless and have LESS sugar in them!